Mark is about to go on a skiing trip with his new girlfriend, Melissa. Melissa was his very first online date and has proven to be a remarkable find. However, Mark is not very good at skiing nor is he particularly excited to go on this skiing trip. But, being a team player, he decides to go. The Ski slopes have 6 different levels ranging from easy to more challenging. On Level 1, a short hill, Mark skis down with ease. On Level 2, a short but slightly longer hill, Mark skis down with ease. On Level 3, a longer hill, Mark skis down with ease. 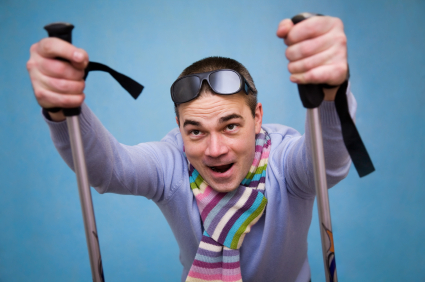 “Wow, I thought you said you weren’t a good skier. You are taking these hills like a pro,” Melissa says, absolutely beaming at her man. “Come on, don’t tell me that you are running scared on me?” Mark says. Mark gets in position and skis down Level 6. With the end of the downhill slope in sight, Mark realizes something. The slope actually doesn’t stop at the bottom like the others. After 4 months in the hospital, Melissa finally asks him why he had been so stupid by skipping to Level 6.